This series serves researchers, teachers and students in the field of symbolic logic, broadly interpreted. The aim of the series is to bring publications to the logic community with the least possible delay and to provide rapid dissemination of the latest research. Scientific quality is the overriding criterion by which submissions are evaluated. 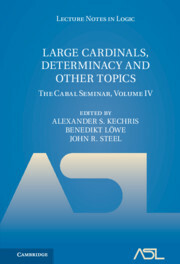 More information, including a list of the books in the series, can be found at http://www.aslonline.org/books-lnl.html.